Bottle gourd peel chutney is delicious chutney among all the other chutney. It is the blend of cooked bottle gourd peels, coconut and some roasted spices. 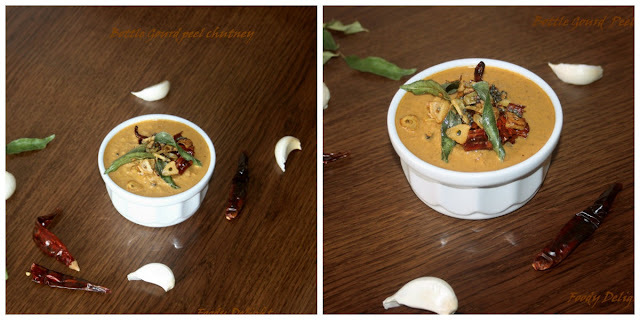 This chutney can be served with rice or any Indian bread. Wash the bottlegourd peels and cook them along with tamarind pulp and salt. Also add little water and cook the peels until soft. Once the peels are cooked , allow them to cool down. Meanwhile heat oil into one pan and fry all the spices till they are light golden in colour. Transfer the cooked peels, fried spices, and grated coconut into blender and blend it to smooth paste. Take out the paste into one bowl Add salt and little water depending on the desired chutney consistency. Mix well. Now it’s the time for tempering. So heat oil into pan and add the tempering ingredients one by one. Fry them till light golden in colour. Transfer the tempering in the chutney and mix well. Delicious and definitely an interesting chutney.